The word “cancer” causes discomfort for many people. According to the American Cancer Society, more than one million people in the United States get cancer each year. Apart from genetic factors, the most common cause of cancer appearance is your lifestyle – smoking, poor diet, physical inactivity, certain infections, environmental exposure to different types of chemicals, radiation and cancer causing foods. 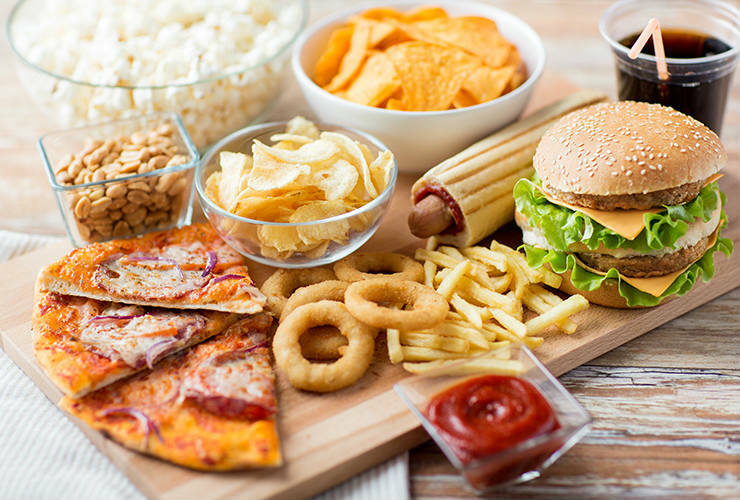 Commercially prepared food contains different substances, such as artificial colors, chemical flavors, sugar, salt and various artificial sweeteners. Presumably, salted, pickled and smoked foods can increase the risk of cancer. As an example, in Japan, where salty and pickled foods are the most typical, the rate of gastric cancer occurrence is high. According to the epidemiological study published in 2010, in the American Journal of Clinical Nutrition, foods high in salt can increase the risk of stomach cancer by 10%. Artificially colored food is too risky for human health, as demonstrated through multiple experiments made on animals. Stomach and colon cancer are common in people who eat red and processed meat. The red meat includes fresh minced meat, frozen beef, pork, lamb and veal. Processed meat includes ham, salami, bacon, sausage, pâté, preserving meat etc… Processed meats contain sodium nitrite, added to keep the color of the meat and extend the shelf life. These compounds are converted into nitrosamines and can cause cancer. Bacon and smoked meats increases exposure to carcinogenic chemicals. Roast meat creates chemicals that damage our cells and increases the cancer appearance chance. An example is prepared grilled meat, which is the worst kind of food that increases the risk of cancer. Many websites promote the idea that sugar “feeds” cancer. They suggest that eating sugar makes cancer grow faster and spread. Because of that, cancer patients avoid eating sugar, even one from the natural fruit, although it contains nutrients. According to researchers in the Mayo clinic, sugar accelerates cancer growth. All cells in the body, including cancer cells, depend on blood sugar, which give energy. According to the Canadian Cancer Society, people who eat sugary foods gain their weight. Particularly the obesity causes changes in hormone levels and therefore increases the risk of colon, uterine or breast cancer. You should not exclude the sugar intake. You should limit it. Sugar is found in sweets, cookies, cakes, soft drinks, etc., but can also be found in pasta sauce, canned vegetables and salad dressings. So, when you buy food, pay attention to labels of the hidden sugars as fructose, lactose, sucrose, maltose, dextrose or glucose. Natural sugars are molasses, honey and maple syrup. They contain beneficial antioxidants, but should be also consumed in moderation. French fries, potato chips and other snacks contain high levels of acrylamide that forms carcinogens when food is heated at a temperature above 250°F (frying or baking). The heating up of already cooked food increases the amount of acrylamide also. However, earlier studies failed to find any link between acrylamide and various types of cancer in humans. Another type of cancer causing foods are that containing trans-fats or trans-fatty acids. They are liquid oils that manufacturers converted into solid fats, such as margarine, cereals, pastries, chips, crackers, salad dressings, granola bars, cakes and other processed foods. Trans-fats increase the risk of cardiovascular disease, type 2 diabetes and prostate cancer – the highest ranked of malignant cancers in American men. Chronic inflammation has a great relationship between prostate cancer and trans-fats. However, it requires further research and clinical trials to prove this. Drinking alcohol and the cancer occurrence have a close relationship. According to Cancer Research UK and American Cancer society, alcohol increases the risk of mouth, liver, breast, colon and throat cancer. Everybody knows that red wine has anti-cancer properties. American Cancer Society recommends that people who drink alcohol should limit the intake to no more than two drinks per day for men and one drink per day for women. Each intervention is welcome and beneficial to human health. With minimal use or disposal of the harmful declared food, you will reduce your risk of cancer.